Remember that sweet, snuggly baby you were rocking to sleep last night? Well, don’t look now, but I think he’s trying to climb out of his crib, so he can push all the buttons in your house (both literally and figuratively). That’s right. Your baby isn’t a baby anymore. You’ve now got a card-carrying member of the toddler club in your home and a whole new season of parenting to start figuring out. Here’s one thing you’ve probably already figured out: The toddler years are filled with pros and cons. Pro: Your toddler can finally tell you what he wants. Con: Your toddler wants to say NO! all. the. time. Pro: Your toddler is old enough to explore new tastes and textures! Con: Your toddler hates everything that’s not mushy noodles. Pro: Your toddler makes you laugh at his farts and underwear dances. Con: Your toddler farts and does underwear dances AT CHURCH. Pro: The diaper train is reaching the end of the line. Con: You’ve got to conduct the train or (you fear) it will go on forever. There’s a lot of laughter and fun that comes along with the toddler years, but it’s also new terrain. And with new terrain comes feelings of uncertainty and apprehension as you try to catch some solid footing again. Well, fear not. 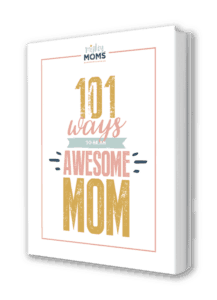 The Mighty Moms have got you covered with another Secret Handbook to help you find your footing as you parent your toddler (which, to be clear, is any child in the 2-3 year age range). We’ve got lots of helpful tips and resources about things like sleep habits, potty training, and your child’s tendency to assert his independence. Mostly, though, we want you to know that this season of parenting and child development is something to cherish. You will love these years. So, let’s talk about what to expect. If you want to check out the other articles in our Mighty Moms Secret Handbook, series, just scroll to the bottom of the page! Just look for the articles that have our “Stamp of Approval” in the left-hand corner, and a similar graphic design to this one! Lookin’ at you, moms of babies and preschoolers! With a toddler in your house now, you are no doubt starting to see some clear personality traits develop. One of the best things you can do for your child during this phase is study her. Observe the way she reacts to situations and analyze what things send her straight into meltdown city. The more you understand her personality, the better you will be able to help her navigate all she has to learn during these formative years. Your tiny human might be a drama queen if she goes straight into lots of theatrics as soon as she hears you utter her most dreaded word: “No.” She’s not afraid of telling you how she feels as loudly as possible and can be difficult to de-escalate. She’s probably seeking attention, so give her healthy ways to get that by providing a dress-up box (superheroes and princesses can play dress-up!) and encourage her to practice her pretend-play skills. Understand her triggers. Figure out what things are likely to upset her and then teach her how to manage those feelings and transition between tasks. Communicate up front, before you go into public, what your expectations are. This will greatly help you to avoid public meltdowns. Drama Queen silver lining: Children who are obvious about their feelings now tend to be upfront about their feelings later – which is a good thing come Teenagehood! Your Mr. Bossy Boots is a take charge kind of guy. He loves to tell everyone exactly what they should do, and you may experience some angry outbursts when he finds other people (or pets) don’t do exactly as he says. Ask him to rephrase his request and show him how that should look. Model appropriate words like “please” and teach him to phrase his requests as kind questions. Then, ask him to repeat your words. This will teach him how to communicate in less aggressive ways. Give this child two choices, so he feels he has some control over his environment. This will lower the chances of him getting frustrated and lashing out in an angry temper tantrum. Mr. Bossy Boots silver lining: Your child isn’t going to be a sucker for peer pressure. He will be a leader! Your Shy Guy is an expert at staying on the perimeter of new situations. His tendency is to analyze new circumstances from a safe and uninvolved distance. He likely won’t dive into social interaction unless nudged. Provide opportunities for him to practice social interaction. Invite a few friends over for a playdate or attend a local library storytime. Don’t push him too hard, and praise him when he does willingly involve himself! Give him plenty of time to prepare for new people and places by walking him through what he can expect from an upcoming playdate. Shy Guy silver lining: This is not a child you’re going to have to worry about jumping off the roof or trying new dangerous “stunts” on his bike that lead to a trip to the ER! If you have a family jester, it won’t take you too long to remember the last hilarious thing she said. In fact, you’re probably still laughing about it. These kids love to talk (even if they don’t understand everything they’re saying) and make friends easily because of their outspoken and excitable behavior. You probably have an extroverted child on your hands who gains energy from being around people. Make sure you are finding ways to meet this need (which is especially important to keep in mind if you fall more on the introverted side of the spectrum). She can wear herself out by the end of the day, so make sure she gets that afternoon nap to avoid burnout! Family Jester silver lining: She will make everyone around her smile and bring a lot more color into day-to-day living! As you watch your child’s personality continue to develop, you’ll also start to hear her vocabulary explode. Between the ages of two and three, your child will likely go from saying single words (“Go!” or “Bye-Bye!”) to a variety of multiple world sentences (“I go bye-bye!”). While you’ll definitely still hear babbling during this stage, you’ll start to see that your child is figuring out that his words mean something. He will soon learn that he can use these words to get attention, meet a need, or express his feelings. Oh, you were already doing both of those things? Great. You’re right on track! Just as your pediatrician will track your child’s physical growth at each well-child visit, she’ll also keep track of how his language is developing. Now, if your child doesn’t do these things, don’t panic. Just bring up your concerns at your next well-check. Your pediatrician will know if an intervention or therapy should be introduced. There is no denying that brain development; you can literally see it happening before your eyes! Cherish those changes. You play a key role in helping his brain continue to learn and grow during this stage! Read books together, and encourage him to expand his vocabulary by talking through the things happening around you and asking good questions while you’re reading. When you start to get bored of the books on your shelves (you know you kicked that Brown Bear book under the couch last night because you couldn’t bring yourself to read it for the millionth time), introduce some new ones! There are so many great options to choose from! When your toddler is upset, help him learn the words to express how he’s feeling. Model appropriate language when he would be otherwise inclined to yell and scream. Think outside the box when it comes to planning activities for in between naps. Invest in some brain-boosting toys to play with together. Not only will a set of magnetic blocks help teach him some important skills, but you will also have fun playing with them! Try ABC Mouse for free for 30 days to get an early start on preschool. Do you know what else that little toddler’s brain needs to help it continue to develop? Her brain needs sleep to grow, and by shutting down her limbs, the brain can concentrate on continuing to develop the important systems. You know how important sleep is, but you also know that your little Miss Drama Queen has figured out that she can now try to avoid sleep at all costs. Is the room too bright? Are there are too many distractions or things to look at while your child is trying to fall asleep? Boredom is your best friend at naptime! Did your child turn into a jack-in-the-box sleeper when you transitioned her out of her crib? Did you miss that Wakefulness Window? If you wait too long, you might find it very difficult to settle her down to sleep. Do you have a nap time and bedtime routine? You couldn’t go to sleep right after a rock concert, so don’t expect your toddler to fall asleep right after a busy morning of activities. She needs time to wind down and a repeated routine each day and night will help signal that bedtime is coming. Is your toddler showing signs of sleep apnea? Doctors are discovering this condition is a lot more common in children than originally thought! If you’re struggling in the sleep arena, you need to know that you’re not alone. Toddler sleep issues can be tough, but consistency is more important now than ever. Let a Certified Gentle Sleep Coach help with your toddler’s sleeping struggles. From staying in bed, to napping, a GSC can help you create a gentle plan to fix even the most stubborn of sleepers. It even comes with a 110% Money Back Sleeping Guarantee! Toddler independence can get a bad rap sometimes (lookin’ at you, grocery store temper tantrum). But what we don’t say enough is how wonderful it can be to watch your little guy learn to do things on his own. Not only will this help YOU (especially if you have a baby on the way), it will also give him self-confidence and a feeling of belonging as you are all working together. Choose a small task (like picking up toys) and let that be HIS task. (If you need help with chore ideas, use the free chore printable here). Give lots of praise for his efforts (even when it doesn’t get done exactly as you would have done it)! Don’t rush in to do everything; give him space to try to complete the task on his own. Rearrange a cabinet or two so he can reach the bowls and cups on this own, perhaps with a safe stepping stool he can use to reach the water faucet all by himself. Be encouraging in the face of failures. If he tries to pour the juice and spills it, make recommendations on how to do things differently, but refrain from putting down his efforts. You don’t want him to be so afraid of failure he stops trying. Have realistic standards! He’s not going to fold the towels perfectly, and that’s okay. There’s lots of time to learn! Give rewards! Use a reward chart to help your child earn special time with Mom and Dad, a new toy, or tablet time. Not only does this motivate him to work hard, it teaches him how to set and achieve reasonable goals. You’ll hear this word exclaimed with force when friends come over for a play date and your sweet-natured girl is suddenly red-faced at the thought of sharing her baby doll stroller. Teach your child to use her words. Talk about appropriate words to use when her body starts to feel frustrated. Provide your child opportunities to learn to share, especially if she is the oldest or an only child. Visit your local library or host a play date at your house. Prepare her in advance for a play date. Talk together about what toys it will be fun to share with her friends. Also respect the toys you know she will not want to share (and shouldn’t be expected to). Put away her security blanket or most-loved baby doll in anticipation of friends coming over to play. Everyone has a different opinion on potty training. Age. Gender. Method. No one person has exactly the same idea about when and how it should work. Because everyone’s kids are different. There is no one, single method that will work perfectly for every single kid. You know your child better than anyone, so take the basic principles and then apply them to your child as only you can. Most children begin to show signs that they’re ready for potty training between 18 and 24 months. Some just aren’t ready until closer to age 3. Figure out how to master the throne by reading my article 10 Potty Training Tips That Won’t Make You Feel Like a Complete Failure. Get your equipment ready. You’ll need some big-kid underwear and then either a stand-alone potty chair or a toddler-sized seat that will sit right on top of your toilet. Establish a routine. When you’re first starting to train, place your child on the potty at frequent intervals a day and try to recognize her cues (i.e. grunting or squatting). You want her to recognize the feeling of having to go to the bathroom before she actually starts going. Expect accidents. You will do a lot of laundry during those early days of potty training; there’s just no way around it. Don’t scold your child when he doesn’t quite make it to the potty. Remember, he’s just learning. Continue to encourage and empower, and you will see results! With most things in parenting, consistency is key. Once you decide your child is ready for potty training, stick with it. And, remember, you know your toddler better than anyone. You’ve got this. Psssst. Boy mamas, Chelsea (a fellow #boymom) wrote an article about all the mistakes to avoid when it comes to potty training boys specifically. Make sure you check it out! Another super fun place your child might be learning to assert her independence is at the dinner table. Not only does she likely have an opinion about the color of plate you serve her, but she might also be protesting the food that is actually on it. You know that it is important to put nutritional food inside your child’s body, and you also know that this is one of the most challenging battles to win. If you’ve suddenly got a picky eater on your hands, let’s talk guidelines and suggestions for how you can get good food into that growing body. Is He Getting the Nutrition He Needs? The American Academy of Pediatrics (AAP) is one of your best resources when it comes to nutritional recommendations. Not only do they include tips for your two-year-old or your three-year-old, but they also include a table of unsafe foods (i.e. whole grapes or popcorn) and some sample menus. Depending on size, age, and general activity level, your toddler needs around 1,000-1,400 calories per day. If you want to know how much of each specific food group you should be giving him, this article contains a really helpful guide. The AAP reminds us that this is a normal developmental stage. Don’t become too frustrated, and continue to provide healthy options for your toddler. Build eating into your daily routine. Have three regular meals a day and two healthy snacks in between. Many picky eaters are “grazers” who eat small amounts of food frequently throughout the day, but a set schedule will help ensure she is eating when she’s actually hungry. Involve him in the process. This graphic is a great resource and suggests that kids might be more apt to eat new foods if they are involved in picking them out and/or preparing them. Be creative in your presentation. Some kids really are affected by textures or appearance, so don’t be afraid to blend something up in a smoothie or offer some healthy dips on the side. This article shares 22 ways to outsmart your own picky eater. Don’t despair. Most kids outgrow picky eating between 2 and 5, but if you keep trying and nothing is working, talk to your doctor. It’s one thing to know the nutritional guidelines for your toddler; it’s another thing entirely to figure out different ways to meet those for him every. single. day. If you could use some fresh ideas, don’t worry. Here are a few of our favorite snack and meal recipes for even the pickiest eater! If you’re jonesing for some new meal ideas, check out these articles for some new lunch ideas and a few upgraded dinner options to put in front of your toddler. This helpful article includes some super healthy recipes (both meals and snacks) broken down by age group. Maybe you need some healthy snack tips. Our own Mighty Mom, Kim, has given you some great ideas here. The toddler years. You’re in them, and there’s no going back. Sometimes it can be tempting to wish for those baby years back. Squishy cheeks and sleepy babies sound pretty good when a two-year-old is screaming in your face. They are uninhibited and free. They are curious and excited about EVERYTHING. They are full of joy. They are still in the cuddle-zone. Sure there will be moments of exasperation (you had those with the baby too, remember? ), but these toddler years are truly something to savor. So embrace them, mama. Cherish these moments and live them intentionally with your child. Because pretty soon you’ll blink and find that you have a preschooler on your hands.